What’s inside: The sleek packaging (with a nifty pop-up lid) contains some amazing power-packed antioxidants like Green Coffee and Vitamin E, but it also contains kind ingredients like Grapeseed Extract and Orange Oil for a soothing and deliciously scented revitalizing experience. This product is also free of Parabens and Sulfites. I personally loved the scent (I often hate scented products) as it was clean and fresh. How to use:Â Take a few pumps of product and gently massage it over your skin. I loved how silky and smooth it felt. It took about 4 pumps to completely cover my skin evenly. Once it was on, it started popping and evaporating within a few seconds. I was nervous at first, but it actually tickled a little bit. I rinsed it off afterwards and my skin felt smooth and looked great. Â I was a little red around my nose and around my chin (typical blackhead areas for me), but after a few minutes the redness faded. Other things I love:Â I just want to point out that I LOVE that Radical is led by two sisters who are all about global responsibility and run their business ethics in a manner that I can truly support! You can learn more about them in the video above! Overall? 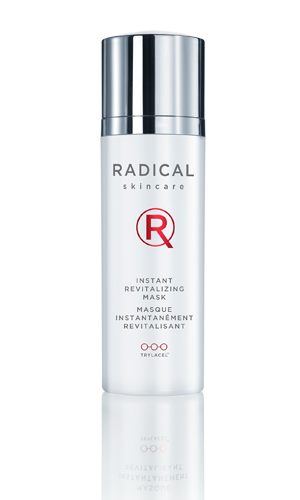 A good product that’s FUN to use and delivers results which is really all I want in a skincare mask. Stay Radical! That’s a little pricey for me but if it works, that’s cool. I like trying out new products but I usually can’t notice a difference in my skin so it usually feels like a waste of money. That sounds like a really great product and it’s good that the people behind it have a bigger insight, then just making money. My skin is so sensitive I would probably get a bit freaked out by the tickling and redness but the popping and evaporating bit sounds fun!